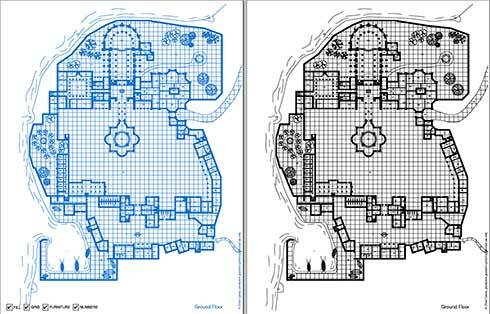 The Blueprints product line offers you old-fashioned blue printed maps for using in your adventures and campaigns. For each map you get a blueprint version and a standard black and white version. The maps are all vector-based so you will get maximum print resolution. Despite their old fashioned appearance each map offers you a degree of customization by using the pdf technology at its best. A small control bar (which will not be printed) on each map allows you to turn on and off the grid, eliminate the room numbers, get the walls filled and don’t show doors and furniture. Each product features a classic fantasy adventure location: a dungeon, a keep, a temple complex, a thieves’ guild and so on. You can use these map as reference to build your own adventures or simply take them at hand in case your players go in an unexpected direction during the campaign. • Upon the party arrival at the citadel some mysterious murders begin to happen. One of the PCs was spotted on the murder place and the entire party is caged in the dungeon. The PCs must escape and found the true assassin to prove their innocence. • A gang of smugglers use the caverns north of the citadel as base for their illegal activities. The lord is too weak to fight them and asks the party to deal with the bandits. • A band of thieves visit regularly all the rich merchant’s houses, leaving no traces or signs. The merchants offer a reward to the group who will capture the thieves and retrieve their wealth. • During the night Kuo-Toas emerge from the murky river water; they seek something in the temple of the citadel, something was stolen from them centuries ago. The local cleric hides a terrible secret linked to this item. The party is hired to protect the item. This title was added to our catalog on May 13, 2005.